Not so long ago, when your best friend or someone in your family moved to another city or country, you had to get used to the idea that you probably would never see or talk to them again. Distance was a massive obstacle that prevented people from staying in touch with their dear ones and these were not the only ties that could be broken apart. Doing business with a company that was located in a different country was not an option for many since international trade was challenging and expensive. However, thanks to technology distances have been reduced and in many cases, they have become a minor issue. Internet offers many options for people to communicate effectively through the distance and one of the best solutions available is VoIP, which stands for Voice over Internet Protocol. Voice over Internet Protocol is a group of technologies that as the name suggests, allow telephony communication over internet. The majority of VoIP services also include video telephony and text chat as part of their features. With the use of dedicated IP Phones, wireless versions known as Wi-Fi phones and Analogue Telephone Adapters (or ATA), companies have been able to reduces costs. For those who use the technology at home, computer-to-computer VoIP has become a convenient and affordable solution to talk to their friends and family abroad. Let’s take a look at the most popular free VoIP providers. Skype is the leading VoIP service provider thanks to its ease of use and great set of features that include free voice, video and text chat. With Skype, you can connect with your friends and family using a computer or mobile device connected to internet. Furthermore, Skype allows users to call to a landline or mobile phone from a computer for a very low cost. Skype offers extensive compatibility that covers different platforms and devices, making it a hugely popular service that is used by millions of people around the world. We also have a list of VPNs for Skype, if this is all you use. Open source software Jitsi is preferred by many users due to its flexibility and free availability. This VoIP chat and video conferencing solution can be used with Windows, OSX and Linux. It has useful features aimed at offering high quality communications. Google strives to offer users solid solutions in different areas and VoIP is not the exception. Google Talk is a strong VoIP service that as expected, works great with Gmail. It is very similar to Skype in terms of features, even though its prices are considerably higher. While it may not be an option for those who own Apple devices, GTalk is a convenient service for many platforms. Apple users can count on FaceTime, the video telephony application that is now integrated into iOS and OSX devices. Even though its functionality is limited as it only allows interaction between Apple devices, it is a practical service that also supports iMessage. VoIP – Why should you use a VPN? We have talked about the advantages of VoIP services and also mentioned some of the most convenient options available. 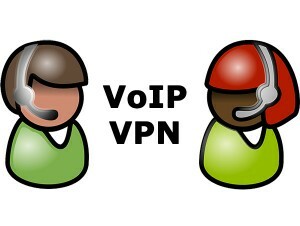 Now, it is important to examine why it is necessary to consider using a VPN with VoIP. As you should be aware by now, your internet traffic is subject to surveillance by the government, large corporations or malicious users. VoIP services are particularly vulnerable as our conversations are likely to include personal information that would be of interest for any of the third-parties we mentioned. If you want to protect your privacy, a VPN offers a convenient solution that allows you to maintain your communications safe from snooping. Services like Skype keep records of conversations and may be required by government organizations to provide this data. Since a VPN service can help you to protect your identity when you sign up to a free VoIP service, it is a must-have technology if privacy and anonymity are your top concerns. Furthermore, a VPN also enables you to bypass firewalls that block VoIP services in countries like China. This means that you can stay in touch with your family using Skype or your favourite VoIP solution, even if you live in a region where they are not available. Here is our list of VPN services that will allow you to enjoy security and freedom to use VoIP services. Private Internet Access has been and remains a favorite provider for millions of users for a few reasons. First, the service works, and although they do not have the largest network, recent years have seen some growth and they still cover a good amount of countries. However, as small as the country list is, it comes with thousands of servers in order to serve enough bandwidth to all users. Finally, PIA has one of the most competitive price points, making them a prime choice for budget conscience consumers. Considering that VOIP users are already looking to save money, Private Internet Access makes a great choice for the application. IPVanish has gained the trust of many users thanks to it reliable service. They own and operate an extensive network of servers located in 60 countries. With a knowledgeable support team, great speeds and a good set of features, IPVanish is another practical option for users that want to secure their connection and access VoIP services without restrictions. VyprVPN offers a reliable service that includes great features that can greatly improve your experience when using VoIP services. Thanks to its Chameleon technology, you will have the possibility of bypassing firewalls and ISP blocks to access VoIP applications like Skype. One of the aspects that make AirVPN a great option for VoIP services is the remarkable speed that this Italian provider offers. They are also dedicated to protect the privacy of your connection, ensuring that you can chat with your relatives or friends without worrying about eavesdropping. With CactusVPN you can protect your anonymity online and unblock VoIP services in any country in the world. This Moldova-based company offers convenient features such as Smart DNS and affordable prices, combined with fast performance. Apart from having a unique and fresh image, CyberGhost also offers an efficient and fast service that keeps your online connection encrypted. They have a good selection of servers and give Premium users the possibility to connect to up to 5 devices simultaneously. CyberGhost stands for affordability, security and also make VoIP services accessible.